3) Summer Infant Extra Tall Walk Thru Gate $47.57: We got this gate off of Ebay although I then found it on Amazon for cheaper (which was super annoying). 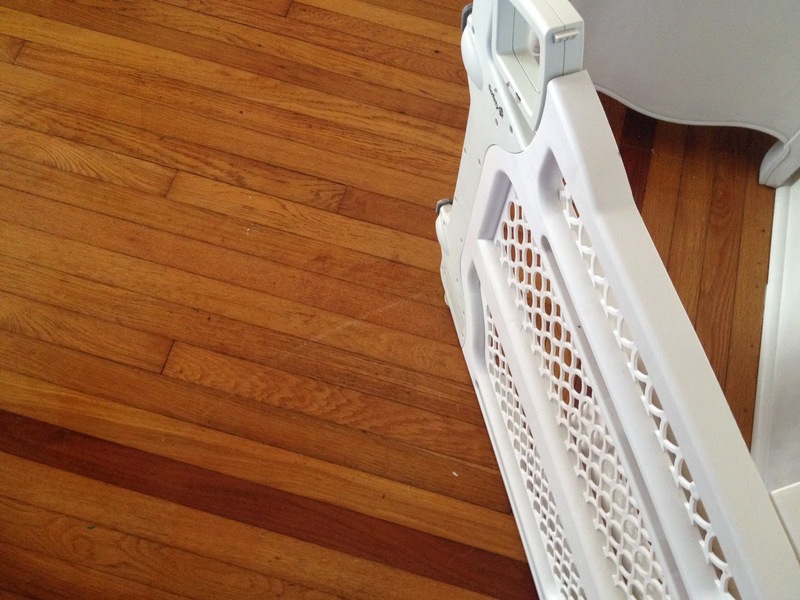 We got it for the entry into the kitchen but it ended up being to tall to fit under the counter. It did not fit any other door opening in our house either (once again... super annoying). 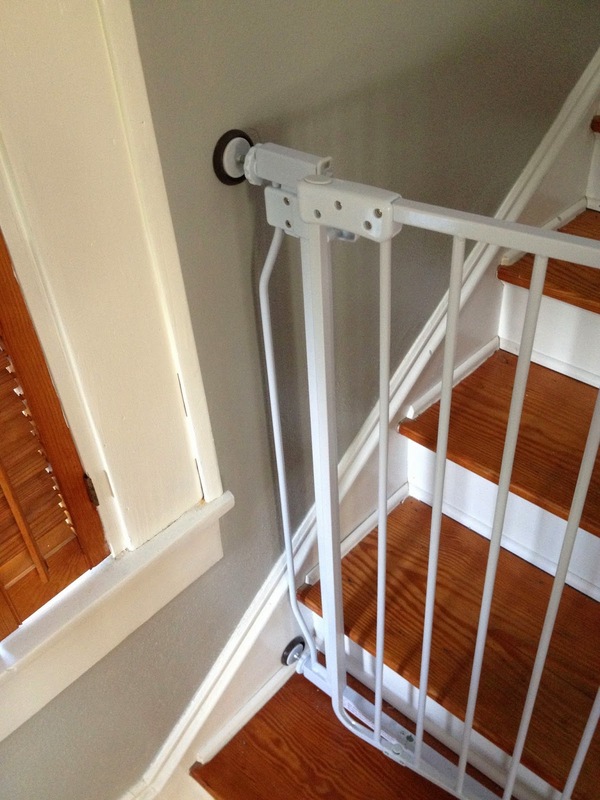 As you can see, this gate now guards the stairs. The hinge only swings one way, so there was only one way to install this gate, and to be honest it's not the ideal configuration (the wall is on the left, so the gate swings into the space rather than against the wall). Furthermore, this gate doesn't really latch too well. Fortunately Will isn't strong enough yet to pull it open, but all it takes is a gentle "lift" and it's ready to open. Of all our gates, this was one of the most disappointing. The hinge only swings one way, so there was only one way to install this gate, and to be honest it's not the ideal configuration (the wall is on the left, so the gate swings into the space rather than against the wall). This gate doesn't really latch too well. It may be that we can't get it perfectly plumb but whatever it is it doesn't work well. Fortunately Will isn't strong enough yet to pull it open, but all it takes is a gentle "lift" and it's ready to open. Would we buy it again? No. Of all our gates, this was one of the most disappointing. Trying to make the best of it, we installed plastic non-slip pads (usually for a couch) and screwed them into the wall to hold onto the pressure points. This has worked pretty ok but it's still an annoying gate. 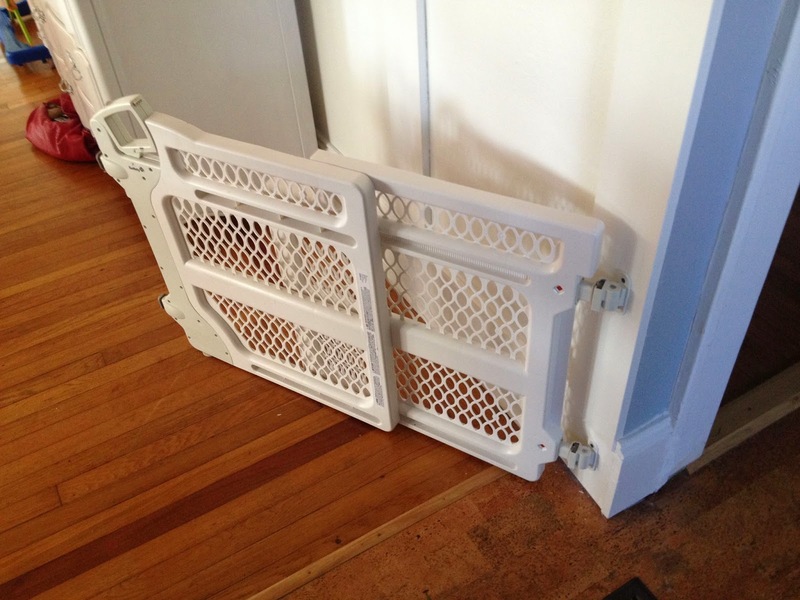 Our friends have the same gate and they have similar issues so I don't think buying off of Ebay was the issue. 4) Safety 1st Lift Lock and Swing Gate $20: The version we have (and pictured) is an older design that I got on clearance at Toy's R Us. I linked to the newer version that is still a pretty good price at $33.98. 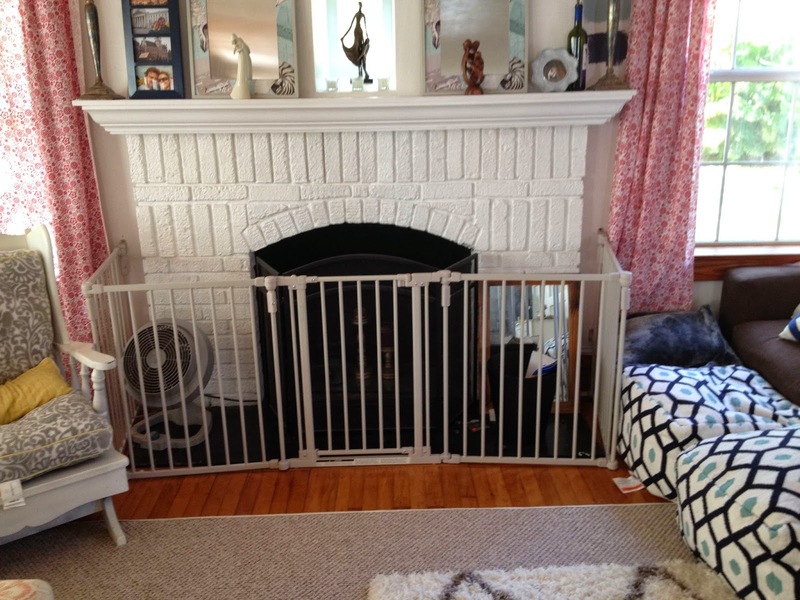 This gate is located between the kitchen and living room. It's a pressure mounted design, and comes with pieces which mount onto the wall. One side is hinged, so it can swing open. The gate is also pretty adjustable (needs screwdriver to change), and comfortably fits into the space between the wall and the peninsula. Would we buy it again? Definitely. Inexpensive, works well and very versatile. 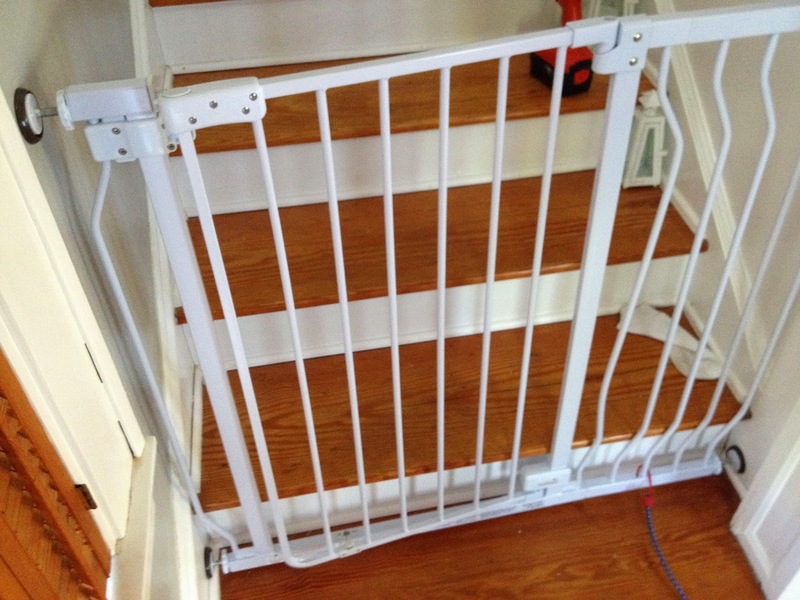 5) North States Superyard 3 in 1 Metal Gate $95.09: The final baby gate is actually more of a wall for us. We needed something to go around the fireplace and keep Will from getting into trouble. This is actually a play yard that comes with mounting brackets for the wall. To keep some functionality of the room, we relocated a wastepaper bin here, as well as the fan. Extremely well built. Of all the gates we bought this is the best design. You can lock the gate pieces at different angles and flip the attachments around to completely customize the length. Easy installation to the wall and can easily pop off (not baby easy but adult easy) to make into a play yard. Gate auto closes, opens with one hand and can even be put into a locked open position so if you are trying to carry things in and out you don't need to keep opening the gate. Would we buy again? Yes! Honestly I'm going to be taking a closer look at North States gates for replacing the gates we're not happy with in the future.